With everything that has been in the news over the last decade about climate change (and the horrendous overall consequences of a heightened temperature), most of us know (cannot possibly avoid knowing) that this is a hot topic that will rage on for years to come. Hopefully, we can find a long-term solution. In the mean time, we’re still trying to understand how we can modify our lifestyles to slow down this process, which brings us to one avenue that might sound a little strange to some of you; Some scientists suggest that global CO2 levels could be lowered, thus cooling the planet, if we were to pump all of the excess CO2 into the world’s vast oceans. Why haven’t we done this yet? In short, because it could cause lots of problems to the delicate ecosystems of Earth, putting the planet as a whole at risk for just a fleeting solution. There are two main carbon sinks (essentially, things that absorb more carbon than they release) in the world, one of them is water and the other is the forests. Trees in forests convert CO2 into breathable oxygen (through photosynthesis), which is a little bit concerning when one considers the epic deforestation that is taking place on a global scale. More specifically, in the Amazon rain forest, which is known as the “Lungs of the Earth.” Ultimately, this deforestation has lead to an increase in global CO2 levels. Fortunately, to balance this out, CO2 is dissolved into the oceans (though it is interesting to note that about 93% of the worlds CO2 is actually contained within the oceans.) Now, this isn’t such a bad thing (all the carbon being absorbed by the ocean) as there are a lot of sea animals that actually use carbon dioxide, oxygen, and calcium to create shells and corals (by forming calcium carbonate), so in that sense, it is actually an essential part of the oceans ecosystem. However, before we jump the gun and start mass pumping CO2 into the oceans, there are some side effects that are a bit problematic–otherwise, we’d already be doing it on a mass scale. As we’ve mentioned, calcium carbonate is one of the ways that CO2 is taken out of the ocean, and that is because it becomes apart of shells, corals and other marine life. When any of these die, they end up on the ocean floor. So over millions and millions of years, the dead marine life moves with the tectonic plates. Under heat and pressure, this calcium carbonate ends up becoming rocks (such as limestone), so we end up with a lot of CO2 eventually ending up in stone. So to sum: CO2 ends up in the oceans (which is already where most of it is contained), some gets formed into shells and corals which end up as stone or fuel (organic matter over millions of years), and by using this organic matter we’re pumping it back into the atmosphere. As such, it seems quite reasonable that we should just be able to pump it back into the oceans to help keep this cycle continuing for millions of years more. However, we’ve found that an increase in CO2 levels in the ocean increases the pH levels. For anyone that has ever had a tropical fish in a tank, they well understand how important it is to keep the correct pH levels. So what is all the fuss about? So far we’ve looked at how the planet combats CO2 levels in the ocean which has been a natural cycle for the last… Very long time! But in the past 200 years, due to human intervention, it’s not looking so good for the oceans. Ever since we started burning fossil fuels and making concrete in such a large scale, the oceans have been paying the toll. In reality, this is why climate change isn’t as noticeable as some might believe–we look at the oceans as being this big blue vast unchanging body of water but it couldn’t be much further from the truth. Over the last 200 years, since the start of the industrial age, research indicates that (due to the increase in CO2 in the atmosphere) these has been a decrease in pH of 0.1 units. Now that doesn’t sound like much at all, but let’s put that into perspective: it’s an increase of 30% in the amount of hydrogen ions in the world’s ocean’s. Because we’re increasing, year by year, the amount of CO2 that we’re producing, current estimates suggest that by the year 2100 it will have increased up to 0.5 units which is a 300% increase in the amount of hydrogen ions in the ocean. As you can imagine, this is a drastic change in the pH levels of the oceans, and given enough time, it is something that could potentially stabilize its self naturally; however, the cold hard truth is that we don’t have a few million years to wait for the natural cycle to fix itself. This leads us to another question. Can we do anything about it? Can we stop the increase in CO2 from impacting the oceans? Sadly, no. As with anything that happens on the Earth on a global scale, we have to consider how much there is that we need to change. There is a LOT of water in the oceans, and changing them is a slow process. There are potential chemicals that we could dump into the ocean to combat the CO2 and hydrogen ions, but they would do far more damage to the ecosystem short term. And really, all of the chemicals would be nothing but a tiny little drop in the entire ocean, best we let natural cycles do what they do. What we can (and really to need do) is control the only thing we can–the amount of CO2 that we’re pumping into the atmosphere. That is the only control that we have. This drastic shift inpH is going to become a very big problem over the next few decades to the biology of the oceans, and studies suggest that it is likely to effect the southern oceans more-so. The report put out by The Royal Society (See further reading) suggests that it is going to be the cold water coral reefs that are going to be impacted the worst. Eventually, it may become more difficult for the various kinds of plankton in the southern ocean, and as they’re at the very bottom of the food chain, everything else in the ocean is going to be affected. So to conclude, CO2 diffusion into the oceans is a natural part of the carbon cycle, and the oceans are supposed to contain upwards of 90% of the worlds CO2. BUT due to the burning of fossil fuels and mass global deforestation, we have dramatically upset the CO2 levels in the atmosphere. To combat this, and help curb global warming, the oceans take in the CO2…but because of the imbalance that human impact has had, the oceans are silently taking the brunt of it. We know that CO2 diffuses better into cold water (it’s one of the reasons we serve soft drinks cold). With global warming melting the polar ice caps and releasing vast amounts of cold water into the oceans, we can say that the process is accelerating. Couple this with the fact that we’re pumping out more and more CO2 at an increasing rate, and the oceans are in trouble. Options-wise, there isn’t much to pick from and we, as a global society, are really struggling with the ONLY variable that we have at our disposal–our own actions. 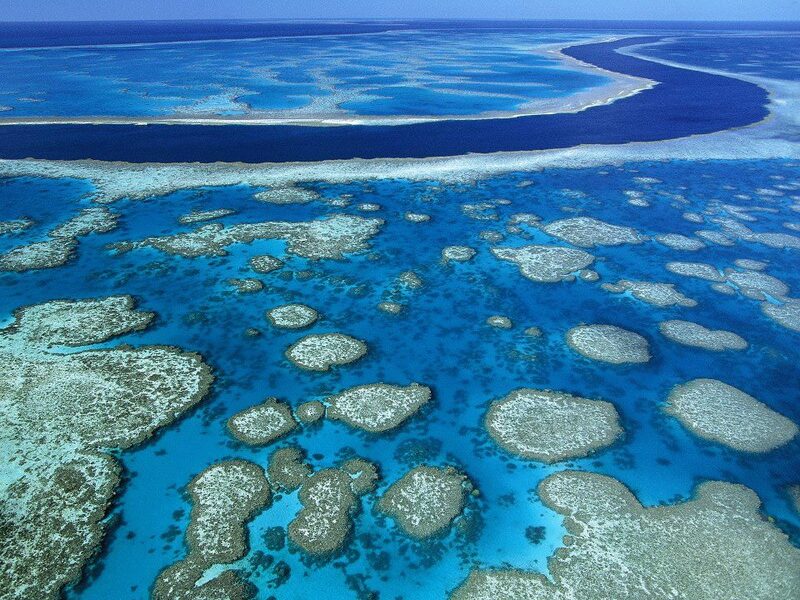 Just to leave everyone with one final thought (and I mean this question quite earnestly), are we going to let the 21st century go down in history as the century that we lost the Great Barrier Reef?